7 Wonders: Duel is the 2 player game of the popular game 7 Wonders. The original game does have a 2 player variant, but the truth is I’ll never play 7 Wonders with two, now that 7 Wonders: Duel is available. What is 7 Wonders: Duel like? 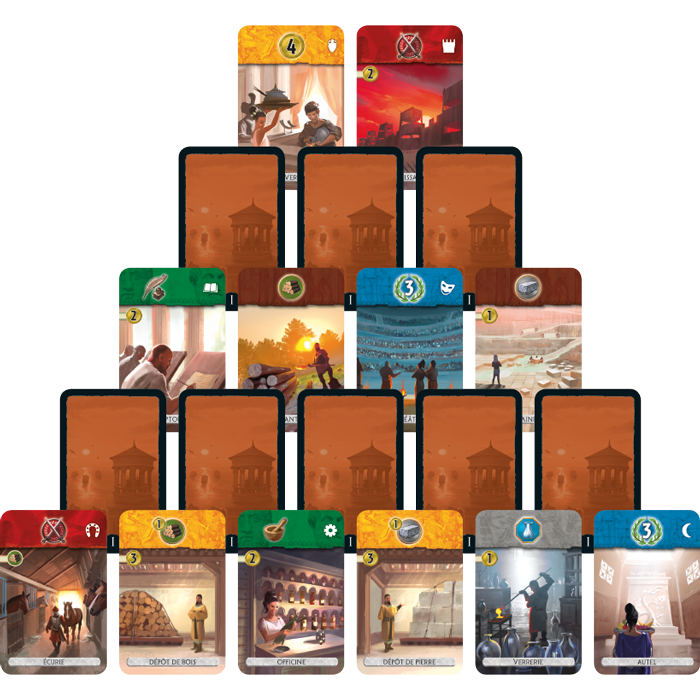 7 Wonders: Duel is like it’s older big brother still a drafting/set collection game, where the drafting is migrated to work very well with two players, while you are still able to hate-draft cards from your opponent. Players draft cards from the table to improve their military, civilian, commercial and scientific powers in their city. Each age the cards are layout in a different way, with half of the cards face – down. The resource economy also remains similar to its bigger brother, although the resources gold and loom have been dropped. What Antoine Bauza and Bruno Cathala did add are two alternative win conditions; scientific and military supremacy. Once a player has achieved such a supremacy that player wins the game instantly. Players can still win the game at the end of the third Age with a civilian victory if no players achieves a Military or Scientific victory. The alternative win conditions are always present during the game and players should watch out for their opponent trying to sneak in a win thru Military or Scientific supremacy. The wonder cards are now also drafted at the start of the game and provide various bonuses when completed. Some of the mechanics only found in the expansions of the 7 Wonders game can be found in this two player version; mechanics that makes your opponent lose money or even resource buildings makes this more cutthroat than its predecessor. There are also wonders that grant a player an extra turn upon completion, which can provide a very powerful tactical play. The game actually is quite a bit different to the big game, but not a lighter game. I had some initial problems with the drafting mechanic in 7 Wonders: Duel, but after a few more games I came to terms with the design choices. I didn’t like the face down cards because it hindered the tactical aspects a bit. Opening up a powerful face down card for your opponent can be very frustrating. But using the wonder ability on some wonders to take an extra turn can really help overcome this. I also needed to get used to the resource distribution and the new trading rules. Eventually everything clicked and I love the game. Drafting the wonders is a very nice strategic element, more so than the starting wonder in the regular 7 Wonders game. Winning a game of 7 Wonders: Duel is very rewarding especially when you win through a military of scientific victory. 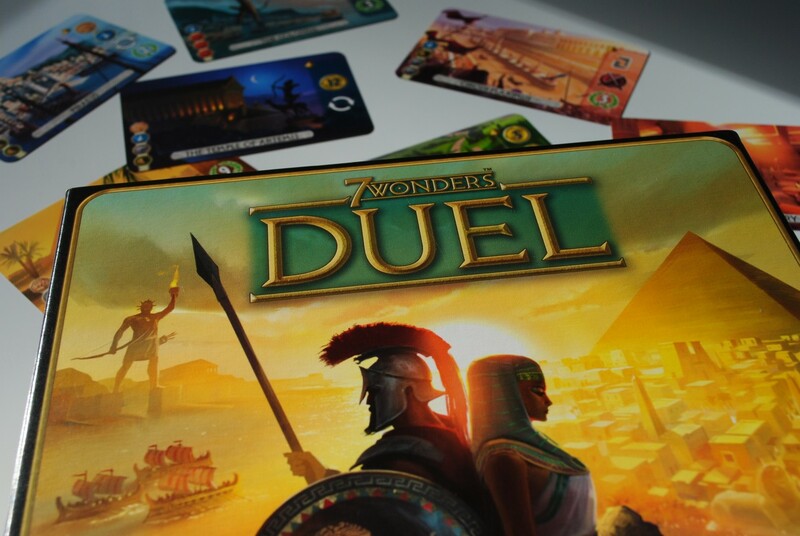 7 Wonders: Duel is a lot of fun, maybe more than you have read in the paragraphs above. For a two player game it is very engaging with tactical and strategical elements all in a small package with a playing time of about 30 minutes. For me a game that gives me some good choices, which looks nice and doesn’t overstay its welcome is fun. And 7 Wonders: Duel does all that! The theme of 7 Wonders: Duel is the same as with its bigger brother. Players build their kingdom with cards representing various guilds, civilian, military, scientific and commercial buildings. The theme is not really strong, but the artwork does a lot to enhance the theme. You do get the sense of building something. The military win condition is achieved thru a push-and-pull combat system which is more thematic than just adding victory points. The artwork is just as stunning as with its bigger brother 7 Wonders. Props to Miguel Coimbra for creating a lot of new artwork, instead of reusing older art from 7 Wonders. The wonder cards are nice and big and the art really shines on those. The presentation of the game is well done. The cards are thick but not linen finished. The cards are a bit small maybe, but the upside to small cards is that the game uses less table space with smaller cards. The cards are also never kept in hand or shuffled, so being so small doesn’t really have disadvantages gameplay wise. The art might come through better on bigger cards though… I sleeved the cards and they still fit inside the insert. Very nice!